We do some of our best work when preparing a dinner for company, but of course, in the rush of getting food to the table and the swill of wine, I don’t get too many pictures taken. So, please forgive the lack of visual documentation, but I thought I would introduce you to Navajo tacos, C style. I started dinner in the morning with a 3 lb lamb roast in a large crockpot. This recipe is a variation of the shredded lamb fajitas my mom makes. Stir and set the crockpot to high. I’ve always disliked the vague timing of crockpot recipes but the meat should be falling of the bone in about 5 hours. Mine was done much earlier than the 6 o’clock dinner hour but I kept it on warm and about an hour before dinner I removed the meat, discarded the bone and fat and then shredded the remaining meat. Return the shredded meat to the crock pot and stir tomato, onion, shredded lamb mixture to combine. Voila! Combine the flour, baking powder and salt in a large mixing bowl. Gradually add water, stirring often until dough is very soft. Place on a lightly floured hard surface and knead 5-6 minutes. Grease the sides of the mixing bowl with the vegetable oil and run some oil over the dough ball as well. Cover bowl with a dry cloth and allow to rise for 30 minutes. Break off egg-sized pieces of dough and pat or roll out to 1/2 or 1/4 inch thickness (a floured rolling pin works much better than patting in C’s experience). Remember: the thinner the dough, the crispier. (Our rolled dough is the size of a small tortilla.) Heat one inch of oil in a large skillet to 350 F (oil should be hot but not smoking, we use a thermometer to check, you can also try dropping a small piece of dough in to see how quickly it begins to bubble). Drop dough gently into the oil and pierce the center of each piece with a knife. Cook approximately one minute on each side or until puffy and golden brown. Flip and repeat. 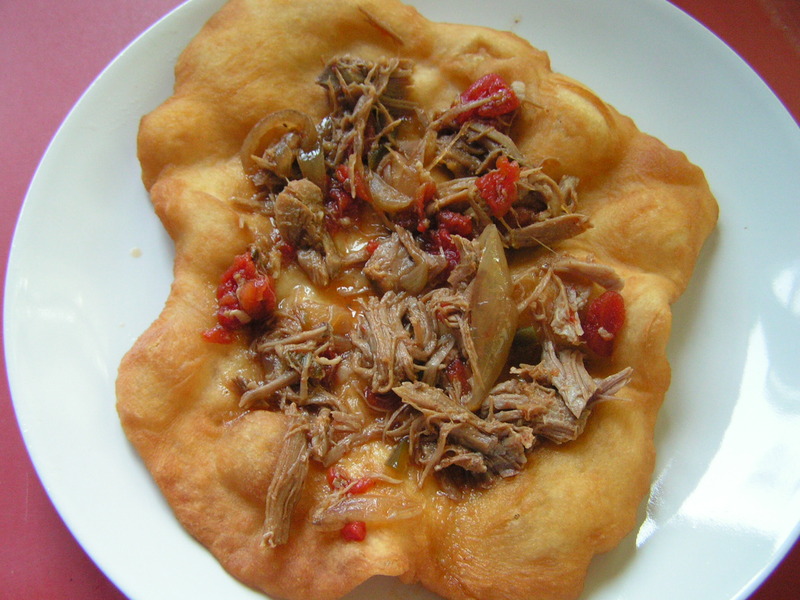 Remove fry bread and blot on paper towels. We like to eat them as if they were large tostadas with beans on the bottom, shredded lamb and then condiments of your choosing. You can also fold in half for a taco. I usually run from recipes that require frying in oil, not so much for health reasons but the thought of hot oil splatters and the cleanup afterwards. However, C does all of the work and manages to not make a mess at all. Give it a try!